ON THE ROAD: OUT & ABOUT IN WASHINGTON, D.C.
On Thursday, after an amazing evening at the Kennedy Center, groups of musicians and patrons ventured out into the city to explore Washington, D.C. Musicians were spotted along the National Mall and at the National Gallery of Art. Did you know that the National Gallery of Art is home to "Ginevra de' Benci" the only painting by Leonardo Da Vinci on public display in the Americas? Patrons of the Albany Symphony enjoyed a private tour of the Library of Congress. Congressman Paul D. Tonko's Office helped the Albany Symphony schedule a private tour of the library's music division. What do Brahms, David Del Tredici, Aaron Copland, and Joan Tower have in common? Thank you to Congressman Paul Tonko and the curatorial staff at the Library of Congress for an incredible tour. The Library is a true national treasure. On Thursday morning, members of the Albany Symphony's Springtime In D.C. tour group enjoyed a private tour of the Library of Congress. Did you know that the original Library of Congress was destroyed by the British during the War of 1812? The library was restored in 1815 when the Library purchased President Thomas Jefferson's personal library, which contained over 6,487 books. With the help of Congressman Paul Tonko's office, we were able to access the Music Division at the Library of Congress. The collection holds over 20.5 million items from the last 1000 years of Western music history. What do Brahms, Aaron Copland, David Del Tredici, and Joan Tower have in common? We were delighted to see the original manuscript of Brahms' Violin Concerto in D with handwritten edits by Brahms. The music librarians also researched our season and pulled the original manuscript of Rhapsody in Blue by George Gershwin and Aaron Copland's personal copy of The Lobster Quadrille from An Alice Symphony by David Del Tredici. Del Tredici and Copland were great friends. Del Tredici would frequently send copies of his latest work to Copland for suggestions. On this score, you can see Copland's suggested revisions. Also on display was an original score by Albany favorite Joan Tower. DAY 3: SPRINGTIME IN D.C.
After lunch at Old Ebbitt Grill- Presidents Grant, Cleveland, Harding, and Theodore Roosevelt's favorite D.C. restaurant- we strolled around D.C. and enjoyed the beautiful spring weather. Albany Symphony development director, Geoff Miller, took a group of patrons to the Tidal Basin to see the cherry blossoms in full bloom, while executive director, Anna Kuwabara, led a group of patrons to the National Portrait Gallery. We all caught spring fever when we saw the tulips on the National Mall in front of the U.S. Capitol. While D.C. is known for its cherry blossoms, nothing compares to the tulips in Albany's Washington Park. The Dogs of Desire moved into their temporary home in Southwest D.C. for their final rehearsal before their D.C. debut at Blind Whino, a hip alternative arts space. Sleeping Giant composers, Chris Cerrone and Timo Andres attended the rehearsal, while David Alan Miller and vocalist Theo Bleckmann polished the program. DAY 3: OFF THE LEASH IN SOUTHWEST D.C. The Dogs of Desire were off the leash at their Washington, D.C. debut at SHIFT. The 18-member new music ensemble is the Albany Symphony's resident new music ensemble and the R&D arm of the orchestra. This was evident on Thursday night as they took the stage at Blind Whino, a re imagined church and alternative arts space in Southwest D.C. If you have not experienced the Dogs of Desire be sure to purchase your ticket to their performance at the American Music Festival on Friday, June 1, 2018. After spending the morning visiting the monuments and touring the Kennedy Center, the Albany Symphony took the stage for a spectacular evening of adventurous music on the national stage. ON THE ROAD: Visits, Pop-ups and more! Yesterday began with Clarice Assad visiting 7th and 8th grade students at KIPP Charter School in Northeast Washington, D.C. Her visit was part of the Albany Symphony's SHIFT residency program that showcased the orchestras Literacy Through Songwriting Workshop: Songwriter Idol. Yesterday morning's visit was the last rehearsal before the students debut on the Kennedy Center's Millennium Stage. Yesterday the musicians of the Albany Symphony packed up their instruments and traveled south to Washington, D.C. to make their Kennedy Center debut. The Capital Region is filled with springtime treasures. From Tulips to picnics in Washington Park to happy hour at your favorite outdoor patio, pair your springtime treasure with an unforgettable experience at the Albany Symphony. Albany, NY- The Albany Symphony, under the direction of GRAMMY® Award-winning conductor David Alan Miller, presents a reprise of The Mighty Erie Canal, an Albany Symphony commission by composer Dorothy Chang, hailed as “evocative and kaleidoscopic” (Seattle Times), on Saturday, March 10, 7:30PM at the Palace Theatre in Albany, NY. At the center of the performance is a 160-voice All City Elementary School Choir from the Troy City School District. Commissioned as part of the Albany Symphony’s highly regarded composer-educator residency program, The Mighty Erie Canal is a children’s operetta based on the story of the Erie Canal and is the result of a two-year collaboration with students from George Washington and Poestenkill Elementary Schools in Averill Park and their teacher, Martha Bove. Today, more than a decade after its premiere, 4th and 5th grade students from all five public elementary schools in Troy and members of the Troy Middle School’s 6th Grade Choir will revisit the work to celebrate the Erie Canal’s bicentennial and the orchestra’s upcoming Kennedy Center debut at SHIFT: Festival of American Orchestras. Approached by the orchestra in October, Rhonda Hermance, a 33-year veteran music teacher who dedicated her entire career to teaching in Troy, quickly embraced the opportunity for her students and began recruiting her colleagues to participate. Hermance amassed a choir of over 160 young and diverse voices from every neighborhood in Troy. When asked about the importance of this project to her students, Hermance said: “The Albany Symphony is providing a wonderful opportunity to the Troy students to experience music performance and musicianship. Students are meeting the professional challenge and are practicing to be their best.” Hermance, who also served as Music Director of the Metropolitan Opera Company’s Creating Opera Program from 1998-2001 is scheduled to retire at the end of this school year. The Albany Symphony has a strong long-standing relationship with the Troy City School District. David Alan Miller describes the relationship with the Troy City School District as “a powerful and important relationship. Our musicians have been active in the community for more than a decade through the Albany Symphony’s Adopt-a-School program, but the true heroes are the dedicated music teachers like Rhonda Hermance, who go above and beyond to make performance and learning opportunities like this possible. This concert program will also feature Michael Daugherty’s Reflections on the Mississippi, which was recently released by NAXOS Records, Michael Torke’s Three Manhattan Bridges, and Still/Rapid by Joan Tower. Tickets for the Albany Symphony performance can be purchased by calling 518.694.3300, online at www.albanysymphony.com, or by visiting the Albany Symphony Box Office at 19 Clinton Ave., Albany, NY 12207. The Albany Symphony’s season, which spans nine months from October through June, features timeless masterpieces, brilliant soloists, thrilling new compositions, and holiday and family programming. The trailblazing American Music Festival caps each season with a full week of dynamic new works by some of today’s best composers. As the only professional orchestra based in the Capital Region, the Albany Symphony enriches a broad and diverse community and engages more than 150,000 people each year throughout the area. Grammy Award-winning conductor David Alan Miller has established a reputation as one of the leading American conductors of his generation. Music Director of the Albany Symphony since 1992, Mr. Miller has proven himself a creative and compelling orchestra builder. Through exploration of unusual repertoire, educational programming, community outreach and recording initiatives, he has reaffirmed the Albany Symphony’s reputation as a champion of American symphonic music and one of its most innovative orchestras. He and the orchestra have twice appeared in "Spring For Music” at Carnegie Hall. Other accolades include the 2003 Ditson Conductor’s Award, the 2001 ASCAP Morton Gould Award for Innovative Programming and ASCAP’s first-ever Leonard Bernstein Award for Outstanding Educational Programming. In July, 2017, he and the Albany Symphony commemorated the Bicentennial of the Erie Canal with “Water Music NY,” a week-long orchestral barge journey from Albany to Buffalo, NY, performing seven major collaborative works for orchestra and collaborating arts groups in seven Canal-side communities. In demand as a guest conductor, Mr. Miller has worked with most of America’s major orchestras, including the orchestras of Baltimore, Los Angeles, New York, Philadelphia and San Francisco. In addition, he has appeared frequently throughout Europe, Australia and the Far East as guest conductor. Mr. Miller received his Grammy Award in January 2014 for his recording of John Corigliano's "Conjurer," with the Albany Symphony and Dame Evelyn Glennie. His extensive discography includes over 30 commercial recordings for Deutsche Grammophon, London/Decca, Naxos, and Albany Records of works by Todd Levin with the London Symphony Orchestra, Michael Daugherty, Kamran Ince, Michael Torke, Christopher Rouse, Luis Tinoco John Harbison, Aaron Jay Kernis, Roy Harris, Morton Gould, Peter Mennin, and Vincent Persichetti. A native of Los Angeles, David Alan Miller is a graduate of University of California, Berkeley, and The Juilliard School. Prior to his appointment in Albany, Mr. Miller was Associate Conductor of the Los Angeles Philharmonic and Music Director of the New York Youth Symphony. A small urban school district with approximately 4,300 students, we have programs housed in eight buildings. Troy has achieved remarkable progress in recent years. Our school improvement efforts have not only raised expectations, but also resulted in measurable changes across the district. The district’s public schools continue to serve as a vital part of the city of Troy’s revitalization. Troy is one of the largest school districts in the Capital Region. The personalized nature of being a small city school district empowers students to excel in an environment that encourages and supports lifelong learning. The school district has recently instituted a number of policies to elevate academic achievement. The Performing Arts Department of The Troy City School District is dedicated to providing all students in Grades K-12 with a high quality music education. This includes incorporating and supporting the National and State Arts Standards while supporting creativity, communication skills, teamwork and self-discipline through diverse performing arts and musical experiences. The Albany Symphony has been selected by the John F. Kennedy Center for the Performing Arts and Washington Performing Arts as one of four American orchestras nationwide to perform in SHIFT: A Festival of American Orchestras. (ALBANY, NY) – The Albany Symphony announces an open call for scores for its annual “First Draughts” Reading Session. Open to young & emerging composers nationwide looking to develop and refine their orchestral craft, the Albany Symphony will select three winners to join the orchestra during its annual American Music Festival in June 2018. The central event will be a reading session of a new work by each of the three selected composers by the full Albany Symphony, led by Music Director, David Alan Miller. In addition, the three composers will attend the orchestra's entire American Music Festival, participating in unique professional development sessions, in-depth collaborations with the symphony’s celebrated resident composers - including David Del Tredici, Chris Theofanidis, and others - and attend all rehearsals and performances. The competition is funded by the Andrew W. Mellon Foundation, which continues the orchestra’s venerable tradition of commitment to new music, particularly through nurturing new compositional voices. The initiative fosters collaboration between the orchestra, its audiences, and nationally acclaimed and emerging composers. The orchestra will accept applications between January 15, 2018 and March 15, 2018. The Albany Symphony is one of this region’s most revered music and cultural institutions, having won numerous national awards for its adventurous concert programming, recording projects, composer residencies, and innovative educational efforts involving area schools throughout the region. The Albany Symphony enriches a broad and diverse regional community throughout New York’s Capital Region, tri-state area, and beyond. Central to the Albany Symphony’s mission is its recording of works by living composers. Among its myriad of recently-completed recording projects are discs devoted to works by George Tsontakis, Christopher Rouse, Michael Torke, John Harbison, John Corigliano, and Michael Daugherty. CELEBRATE HANUKKAH WITH THESE THREE WORKS. Tonight begins the fourth night of Hanukkah. Here are three works that celebrate Jewish stories and traditions. Composed in 1933, Avodath Hakodesh is based on Hebrew text from the Sabbath liturgy. Tehillim (Psalms) was composed in 1981 and is the first work to reflect Reich's Jewish heritage. GEorGE FRIDERIC HANDEL- SEE, THE CONQU'RING HERO COMES! Composed in 1746, Judas Maccabaeus is an Oratorio in three acts that retells the Hanukkah Story. Albany, NY- Today, the Albany Symphony announced plans to dedicate and name its top artistic post in honor of Dr. Heinrich Medicus during a special on-stage ceremony at its first subscription concert on November 18, 2017 at the Palace Theatre. The dedication celebrates the legacy of Dr. Medicus who passed away in February and was a long-time patron, beloved board member, and close advisor to Music Director David Alan Miller. This summer, the Albany Symphony received an extraordinary endowment gift from the Estate of Dr. Medicus. The $7 million bequest plus the additional anticipated portion of the Estate’s residuary represent the largest financial gift received in the Symphony’s history. As an endowment gift, the use of the funds is restricted to the income they produce. Through this bequest, Dr. Medicus ensured that his decades of support of the orchestra he loved would continue in perpetuity. Dr. Medicus, who passed away at the age of 98, was a distinguished professor of physics at RPI and brought a wealth of knowledge and experience to the Albany Symphony as an active member of the Board of Directors. Dr. Medicus had a deep love of music and was an enthusiastic supporter of the Albany Symphony up until his last days. Dr. Medicus was instrumental in strengthening the Albany Symphony’s position as a nationally acclaimed orchestra by challenging the organization to produce classical music that was second to none in terms of its quality. With his support, the Albany Symphony was able to invite world class musicians like Joshua Bell and Yo-Yo Ma to the Capital Region. Dr. Medicus was a beloved friend and trusted advisor to Music Director David Alan Miller. The special pre-concert ceremony will begin at 7:30PM led by David Alan Miller and representatives from the Albany Symphony’s Board of Directors. The concert program will feature the Albany Symphony’s first performance of Stravinsky’s Rite of Spring in over 25 years and a dramatic musical retelling of Washington Irving’s Rip Van Winkle by American composer David Del Tredici. In its 2018-19 season, the Albany Symphony will perform a concert with special repertoire in honor of Dr. Medicus’ 100th birthday in December 2018. Tickets to the Albany Symphony performance can be purchased by calling 518.694.3300, online at www.albanysymphony.com, or by visiting the Albany Symphony Box Office at 19 Clinton Ave., Albany, NY 12207. Individuals who are interested in making a donation to the Symphony in memory of Dr. Medicus are encouraged to contact Geoff Miller, Director of Development at 518.694.3300 x151 or via email at GeoffM@AlbanySymphony.com. The Albany Symphony’s programs and events are made possible by the New York State Council on the Arts with the support of Governor Andrew M. Cuomo and the New York State Legislature. Grammy Award-winning conductor David Alan Miller has established a reputation as one of the leading American conductors of his generation. As the Music Director of the Albany Symphony since 1992, Mr. Miller has proven himself a creative and compelling orchestra builder. Through exploration of unusual repertoire, educational programming, community outreach and recording initiatives, he has reaffirmed the Albany Symphony’s reputation as the nation’s leading champion of American symphonic music and one of its most innovative orchestras. He and the orchestra have twice appeared at "Spring For Music," an annual festival of America's most creative orchestras at New York City's Carnegie Hall. Other accolades include Columbia University’s 2003 Ditson Conductor’s Award, the oldest award honoring conductors for their commitment to American music, the 2001 ASCAP Morton Gould Award for Innovative Programming and, in 1999, ASCAP’s first-ever Leonard Bernstein Award for Outstanding Educational Programming. Frequently in demand as a guest conductor, Mr. Miller has worked with most of America’s major orchestras, including the orchestras of Baltimore, Chicago, Cleveland, Detroit, Houston, Indianapolis, Los Angeles, New York, Philadelphia, Pittsburgh and San Francisco, as well as the New World Symphony, the Boston Pops and the New York City Ballet. In addition, he has appeared frequently throughout Europe, Australia and the Far East as guest conductor. He made his first guest appearance with the BBC Scottish Symphony in March, 2014. Mr. Miller received his Grammy Award in January, 2014 for his Naxos recording of John Corigliano's "Conjurer," with the Albany Symphony and Dame Evelyn Glennie. His extensive discography also includes recordings of the works of Todd Levin with the London Symphony Orchestra for Deutsche Grammophon, as well as music by Michael Daugherty, Kamran Ince, and Michael Torke for London/Decca, and of Luis Tinoco for Naxos. His recordings with the Albany Symphony include discs devoted to the music of John Harbison, Roy Harris, Morton Gould, Don Gillis, Peter Mennin, and Vincent Persichetti on the Albany Records label. A native of Los Angeles, David Alan Miller holds a bachelor’s degree from the University of California, Berkeley and a master’s degree in orchestral conducting from The Juilliard School. Prior to his appointment in Albany, Mr. Miller was Associate Conductor of the Los Angeles Philharmonic. From 1982 to 1988, he was Music Director of the New York Youth Symphony, earning considerable acclaim for his work with that ensemble. Mr. Miller lives with his wife and three children in Slingerlands, New York. From the Star Wars characters in the lobby to the Silent Disco at the Galactic Gala, our aim was to transport all participants to a far-away galaxy and celebrate the kick-off to another season. Embark on another thrilling adventure with David Alan Miller and the Albany Symphony. Following #WaterMusicNY, an intrepid summer tour celebrating the Erie Canal's Bicentennial, the Albany Symphony returns to Albany for a spectacular season filled with timeless classics and colorful contemporary masterpieces by some of today's best composers. Here is a sample of what you will hear this fall at the Albany Symphony. Grammy® Award-winning conductor David Alan Miller and the Albany Symphony Release New Album with New York Roots. Albany, NY [August 16, 2017] – The adventurous and intrepid Albany Symphony recently announced the release of its latest album featuring three new works by distinguished New York composer, George Tsontakis. Recorded in Troy, NY at the American Music Festival and the Troy Savings Bank Music Hall, the album was released on August 11, 2017 by Naxos Records, the world’s largest independent classical music record label. Tsontakis, a Grawemayer Award recipient and distinguished composer-in-residence at Bard College and Conservatory in Duchess County, New York, is a major American composer whose newly released album is a compilation of three dazzling never-before-recorded concertos for clarinet, trumpet, and violin. At the center of the album is True Colors, a two-part, jazz-tinged concerto that was commissioned by the Albany Symphony for its principal trumpeter Eric Berlin. In addition to True Colors, the album features Anasa for Clarinet and orchestra, and Unforgettable for two solo violins and orchestra. Anasa builds upon a body of work inspired by Tsontakis’ passion for Greek art and culture. Composed for the legendary clarinet virtuoso David Krakauer and named after the ancient Greek word for "breathe," Anasa includes elements of Klezmer and dance themes inspired by traditional Cretan instruments. The third and final concerto presented on the album is a revision of a previous work commissioned by philanthropist and investor George Soros. Featuring violinists Luosha Fang and Eunice Kim, Unforgettable is a double concerto for violins and orchestra that balances meditative ballads with playful and buoyant gestures. With over 28 commercially recorded albums including Conjurer, the Albany Symphony’s debut recording on Naxos that earned David Alan Miller a 2014 Grammy® Award, the Albany Symphony continues to solidify its national reputation as an incubator for American orchestral music while positioning upstate New York as a destination for international new music audiences. The album is now available for sale at the Albany Symphony Box Office or for digital download on iTunes or wherever you purchase your music. Take the day, grab your clubs, and tee up with Vanguard at the Albany Country Club in support of the Albany Symphony. What are you doing this evening in Brockport after WaterMusicNY? Looking for some fun in the sun in Lockport before the show? How about a kid-friendly restaurant? Brockport and Lockport offer many opportunities for fun this summer for you, your friends, and your family. As The Albany Symphony travels from venue to venue, we will be checking out historical sites along The Erie Canal. Come with us as we explore some of the best places to relax, have fun, and make the most of the Erie Canal experience! Follow our Erie Canal Wish List! Peebles Island is a 190-acre state park with a perimeter trail that offers views of The Hudson and The Mohawk. It's located at the confluence of the two rivers in Waterford, NY. This 26-mile driving route follows the Mohawk River and the first leg of The Erie Canal. Rent kayaks, conoes and other boats at Down By The River and Kayak on the Erie and Mohawk! The walking tour connects twelve of the sixteen double locks of the Enlarged Erie Canal needed to pass Cohoes Falls. These locks are untouched remnants of the 1860s enlargement. You can see the remains of the impressive Schoharie Aqueduct, locks from 1825 and 1841, and hike, bike, and picnic on the banks of the present-day canal. Located toward the western end of over 40 miles of continuous trail in the scenic Mohawk Valley, the Lock 15 site can be used for all types of recreation. Bring a tent or a barbeque and enjoy the evening! Looking for a place to stay or things to do after a night of fun at Water Music NY? How about dining out in Little Falls or a leisurely walk in Baldwinsville next to the Erie Canal? Check out our suggestions for things to do, places to eat and where to stay while you're in town for the Water Music NY performances! The Albany Symphony will be traveling through Little Falls and Baldwinsville on July 5th and 6th for a bicentennial celebration of the Erie Canal. Water Music NY is a unique musical experience 200 years in the making featuring FREE canal side concerts, world premieres by award-winning composers, and selections from Handel's Water Music and other American favorites. The Little Falls concert is a barge performance and you can even catch a fireworks show after the Baldwinsville show! While you're in the area, check out some of these local businesses, museums, and restaurants! The NYS Canal System offers 524 miles of paddling with 125 access points with boat rentals at select locations. Take a leisurely afternoon on the canal with your family and friends and enjoy history and take in the beautiful sights. Shove off from the Little Falls Canal Harbor or the Winds of Cold Springs Harbor in Baldwinsville! Learn More. VoteTilla is an Erie Canal celebration combined with a Women's Suffrage centennial celebration July 17 through the 22nd. The Susan B. Anthony House will be traveling down the canal on a barge from Seneca Falls to Rochester, finishing with a celebration in The Susan B. Anthony House and Museum July 22nd. Learn More. The Erie Canal Museum Focuses on "showcasing the only remaining weighlock building in the United States, the Erie Canal Museum collects and preserves Canal material, and provides engaging educational experiences that champion an appreciation and understanding of the Erie Canal’s transforming effects on the past, present and future." Learn More. Our fully supported cycle tours will follow the Symphony along its entire route. Packages include accommodations, unique and exciting daily activities, gear and luggage transportation, full support, and easy cycling along the remarkably scenic Erie Canalway Bike Trail. Learn More. The Mohawk Towpath Byway "is a series of local, county and state highways that follow the historic route of the Erie Canal between Schenectady and Waterford/Cohoes in upstate New York." Learn More. Beardslee Castle is a fine dining experience fit for royals. Not only is it a beautiful property and dining room, its customers laud its fine American cuisine an excellent service. Get Directions. The Canal Side Inn boasts great service in its lodging and its restaurant. Customers describe it as the perfect blend of American and French cuisines. It is charming, comfortable, and perfect for a family night out. Get Directions. The Copper Moose Ale House is a town staple. The Ale House has a very popular bar, and families love the classic pub food. The Ale House even hosts a 50% off burger menu on Mondays, as their burgers are very popular among their guests. Get Directions. 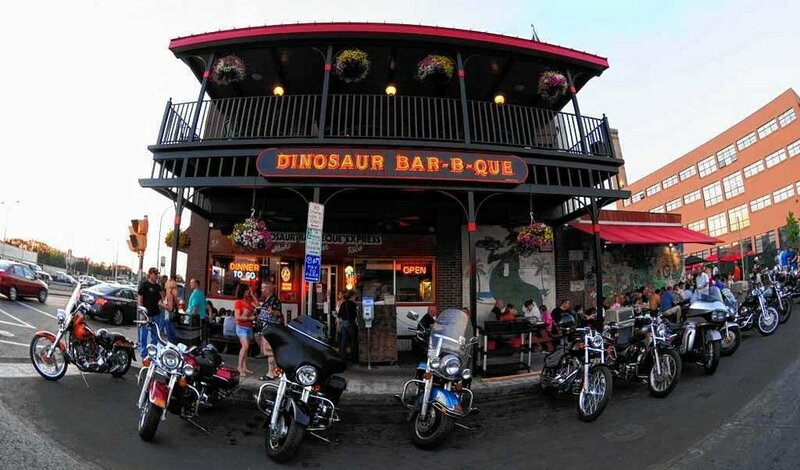 Dinosaur BBQ is beloved by the entire Capital Region. This BBQ Restaurant serves meat on platters along with a fabulous array of southern-style sides. Get Directions. Pastabilities lives up to its name. The restaurant serves tons of different styles of pasta, has a full service bar, and a modern, yet relaxed atmosphere. Get Directions. Laci's is a premiere, locally-owned Tapas Bar in the heart of historic Hawley Green. Known for its small shareable plates and delightful martinis, Laci's Tapas Bar serves up delicious food in a lively location with a neighborhood atmosphere. This 9-mile trail network winds around a glacier lake. This is a perfect spot to bring family and friends for an afternoon of hiking and/or swimming. Learn More. Besides its world-renowned cheese, Little Falls was home to a vibrant ship building and repair community. The Chittenango Museum is one of the few spots where the canal has been untouched since its completion in 1825. Learn More. Originally built in 1833, this old bank building was renovated to house the Little Falls Historical Society. The museum focuses on "the people and contributions of those who settled our community, as well as displays highlighting the Erie Canal and the early Cheese Industry in Little Falls." Learn More. The Overlook Mansion is an elegant, Gilded Age mansion built in 1889 for David Burrell of the historic Burrell Family. Each room has free wifi and cable channels. Some rooms even come with a fireplace and/or balcony. Learn More. The Parkview Hotel is an classic, trendy hotel in Syracuse, just a few miles away from Baldwinsville. Patrons describe it as comfortable mixed with art deco. Learn more.